Instructions: Card size is 5 1/4 x 6 1/4". Using Sweet Plum ink stamp 3 medium, 1 large and 1 small pansies. Color the centers in Buttercup ink and then the remainder in the Lavender ink. Die cut with coordinating dies. Lightly mist and shape in the 3D Pansy mold. Highlight the edges with the Plumeria Ink. Using Bamboo leaves ink, stamp 4 small and 1 large leaves and color with the same ink and cut with coordinating dies. Lightly mist and shape in the 3D Pansy mold. Highlight the edges with the same ink. Using Smokey Gray ink, stamp the Petite Pansy Frame and the Burst of spring Flower Spray. Color the leaves with Bamboo ink and the flowers with the Lavender ink. Cut with coordinating dies. Highlight the frame with the Nuvo Glitter Accents and allow to dry fully. Using white cardstock cut 1 lattice center from the Diamond and Lace Die set. Using white cardstock, cut card base 11 1/4" x 6 1/4". You are going to put in a binder edge, so bone fold at the 5 1/4" mark and then again 1/2" and this will leave the next panel 5 1/4" wide. 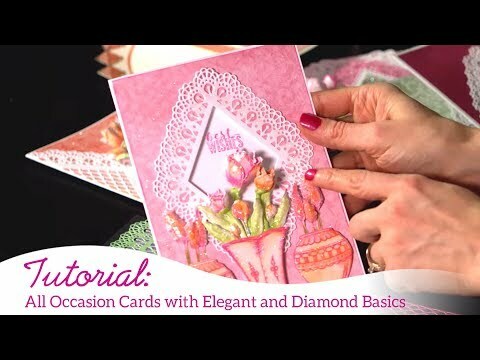 When folded, it will give you a binder edge which will allow you to add dimensional flowers on the inside of the card also. Using the Burst of Spring paper collection, cut mats (1 front, 2 inserts, 1 back) 5"wide x 6 " tall. Cut out the "especially for you" and the "sending love your way" sentiments. Card assembly - Adhere the insert mats. On the left insert panel adhere the Pansy Flower Spray. Adhere 1 large leaf and 1 large pansy and using 3d dots, adhere your "sending love your way" sentiment. On the right insert panel adhere 1 small leaf and 1 small pansy. Adhere front and rear mats. Adhere lattice center. Adhere the pansy frame. Adhere the leaves and pansies over the stamped pansies. Using 3d dots, adhere the sentiment. To finish off, add prills to the flower centers.